MANILA, Philippines — The Professional Regulation Commission (PRC) and the Board of Dentistry released results of November and December 2018 Dentist board exam (Written and Practical Phase) in two (2) working days after the exam. View on this page for the complete list of passers, topnotchers (top 10), top performing schools and performance of schools. 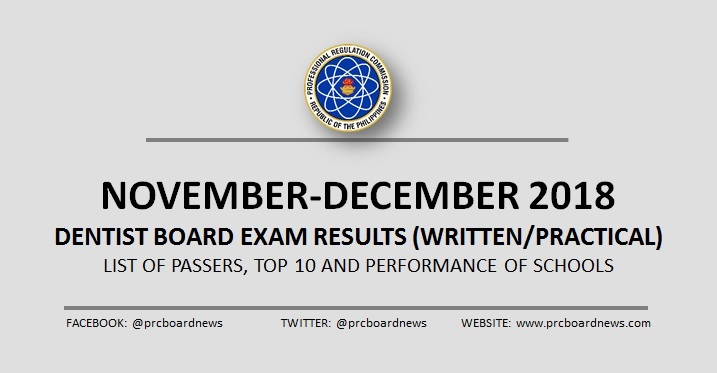 PRC conducted the Written board exam in Manila on November 28, 29 and 30 (theoretical exam). Meanwhile, the practical phase of the licensure exam was administered on December 18, 19, 20 and 21. The performance of schools in the November - December 2018 Dentist Licensure Examination - in alphabetical order as per R.A. 8981 otherwise known as PRC Modernization Act of 2000 Section 7(m) "To monitor the performance of schools in licensure examinations and publish the results thereof in a newspaper of national circulation" is as follows. restorative dentistry and public health and community dentistry, prosthethic dentistry, roentgenology, oral diagnosis and oral surgery and anesthesiology and pharmacology and pediatric dentistry and orthodontics, dental jurisprudence, ethics and practical management, periodontics and endodontics. According to PRC resolution No. 2017-1068, the target release of November 2018 Dentist board exam results is on Wednesday, December 5, 2018 or in three (3) working days after the last day of exam. NOTE: Target release of results for the practical exam is on December 28. In the December 2017 exams, PRC announced results of Written Phase in just two (2) working days. A total of 762 out of 1,484 passed the exams. Thanks so much for the shared list! I think that every single student is happy and excited to pass.